Adding 1 or 2 "live" strands to any wood, vinyl or wire fence protects the animal from the fence and vice versa. 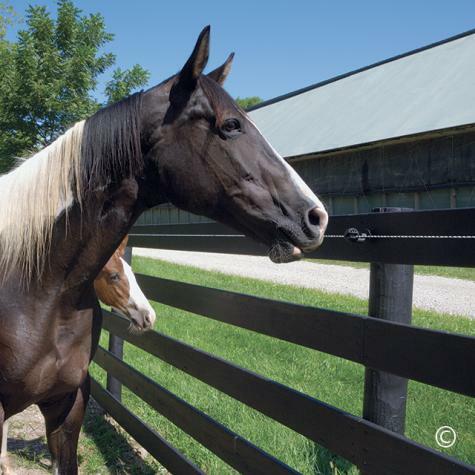 The proper height for the "hot" strand depends on the fence and the height of your animal's nose. Use suitable insulators. The distance the strand should be held away from a fence varies. For vinyl or wood, 2 in. is fine; because injury risk is greater, 7 in. 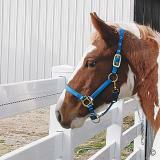 is advised for HT wire fences. Prevents animals from fighting across paddock fences. Keeps animals from leaning, rubbing or chewing on boards or vinyl fence. Enables worn and weary fences to last a few more years. Gives longevity to new fences. Keeps animals away from less-safe fences (HT wire, barbed wire). Carries pulses from a energizer in the barn to outlying fences. The cost of a Guard Strand is only the cost of the conductor, insulators and energizer. Which conductor? IntelliRope® PE 4.5 works well and is not expensive. Which insulator? Depends on the existing fence. Review our insulators (see accessories tab below) and choose the ones that match your line, end and corner posts. Which energizer? You will need an energizer for this fence to help protect animals from a fence—and the fence from the animals (so they won't chew it). Please refer to the Energizer section to determine your needs or refer to our energizer comparison chart. See installation instructions under "Diagram & Accessories" above. 6" offset insulator for attaching low-tension fences to wood line posts. For attaching low-tension conductors to end and corner vinyl posts. For attaching low-tension conductors to vinyl line posts. Use this 11" (suspends conductors 9" from the post) offset insulator for attaching conductors on wood line posts.